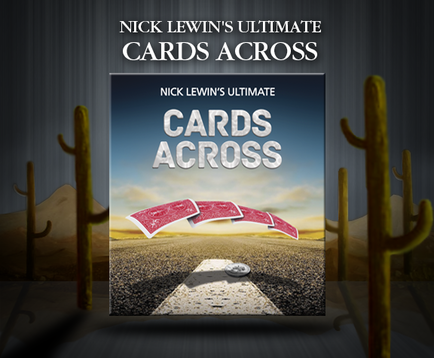 Nick Lewin’s Ultimate Cards Across. The Cards Across is fine magic that has been a hit in many magicians show. However visibility has never been its strongest point. This version has deconstructed the effect and arrived at the most visual Cards Across possible. The punch of having red cards pass into a blue packet makes this an outstandingly visual piece of magic. The cards that can transfer between the two packages can even be selected by audience members in the routine if so desired. The routine plays equally well in a living room or a 2,000 seat theatre and is the ultimate ‘packs small and plays big’ piece of magic. No palming, no angle problems just great magical entertainment for any aged audience. A new improved, streamlined and simplified JUMBO version will be available June 2017. This effect comes complete with the special Bicycle cards, DVD instructions and all the other props needed for you to be able to add this effect to your show immediately. New Streamlined and improved Jumbo coming in February 2018.